Another Ork comes stomping off the shelf of shame and goes to join his painted mates. Blame it on the Oldhammer Ork I painted last week but my attention has turned to the small group of Ork boys that have been gathering dust on the edge of the desk since my last burst of Orky enthusiasm waned back in January. Waaargh! 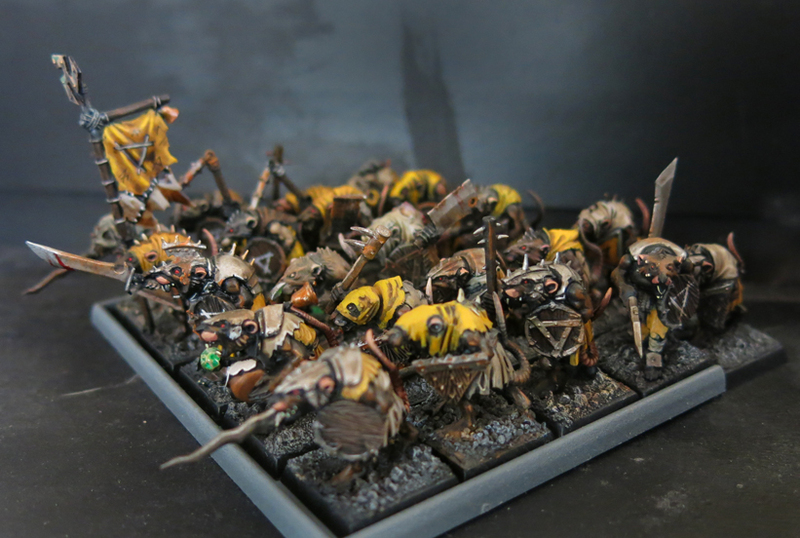 With May drawing to a close it’s time for our by now familiar look back at the progress of my Skaven collection this month. For those who’re new to this the aim of the exercise is to add something, even if it’s only a single rat – although preferably more than that – to my Skaven every month of 2017. For me the Skaven were the very beginning of my exploration of this hobby, the first miniature I ever owned was a ‘ratman’ given me by another boy at school, and for a long time I’ve planned the army of my dreams, a vast host of scabrous fur and rusty weapons. The enormity of the task tended to put me off however and for a long time my rats have been forced to wait, imprisoned on their plastic frames, plotting the moment that a coat of paint would be theirs. The thought of trying to paint all those models froze me with a force equal to the avarice that had driven me to collect them all in the first place. Then, over New Year 2016, it occurred to me that whilst painting the whole collection was a Herculean task painting a few rats each month was easy! So far my instinct to tackle the project this way has been proven correct. Breaking it down into smaller chunks has made for a more achievable task, whilst the constant sense of progression has helped to maintain my enthusiasm. With that in mind let’s take a look at what I’ve managed to finish off this month. First up we have a command unit for my second squad of clanrats (for those who’re keeping track these are the ones armed with close-combat weapons rather than spears). Adding all the sigils to the banner was an adrenalin fuelled bout of heart-in-mouth freehand but I got there in the end. Here’s the whole squad so far, bolstered by the arrival of their new leaders. 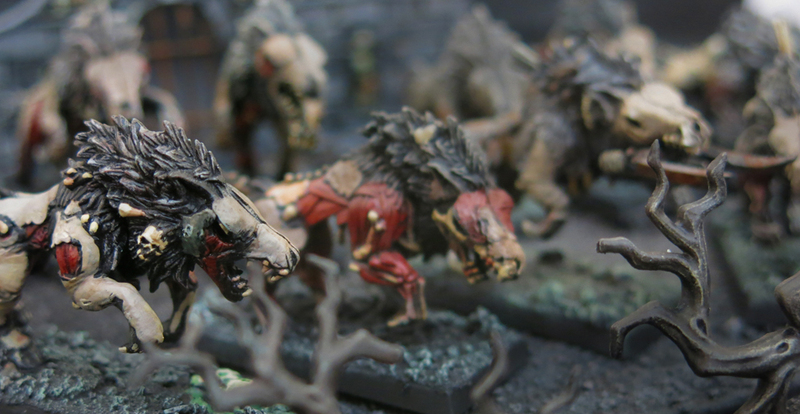 A couple of months ago the legendary Duncan Rhodes demonstrated how to paint an albino clanrat and, whilst re-watching the video, it struck me mixing up the fur and skin colours of my own rats would add to the ragtag appearance of the units. I’ve also finally finished off a warpfire thrower, the first weapon team to join the collection. Last, but not least, we have this plague priest, ready to spread the Great Horned Rat’s foulest infections. At the moment he’s forced to scurry corpulently around unaided but, as soon as I get it finished, he’ll be able to ride in style atop a maddeningly toxic plague furnace. 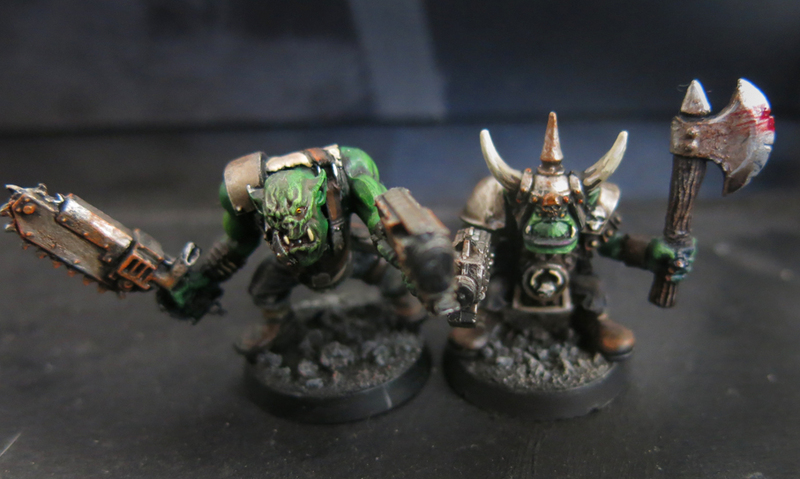 Good Ol’ Boyz – Bonus Grots! Blame it on painting that old Ork but since then I’ve had a real itch to work on a few grots for him to boss around (after all the other lads are never going to stop picking on him for being short so he’ll need someone to bully in turn). Into the box of old models I go to fish out these two gretchin. Like the Ork (and plenty of other things that you’ll see in due course) these were a gift from my good mate Tom who’s been clearing out, so cheers once again dude. This one’s face seems to have lost some of its definition over the years so I kept the highlighting there to a minimum and put extra effort into other areas in order to draw the eye away. And then I spoiled it by telling you all what I’d done. Something about their devious, spiteful little faces made me think of redcaps – the evil goblins which supposedly dwelt in ruins along the border between Scotland and England and make a habit of murdering travellers and painting their hats with the resultant blood. Although I didn’t want to paint this one’s helmet as if actually bloody I did think that giving him a red cap would be a suitable homage to the nasty little bastards. Plus, maybe he reckons it makes his thoughts go faster? Unlike the Orks, who’ve grown somewhat in stature down the years, these grots are still pretty much of the same scale as their modern descendants. At least the Ork no longer feels like such a titch! 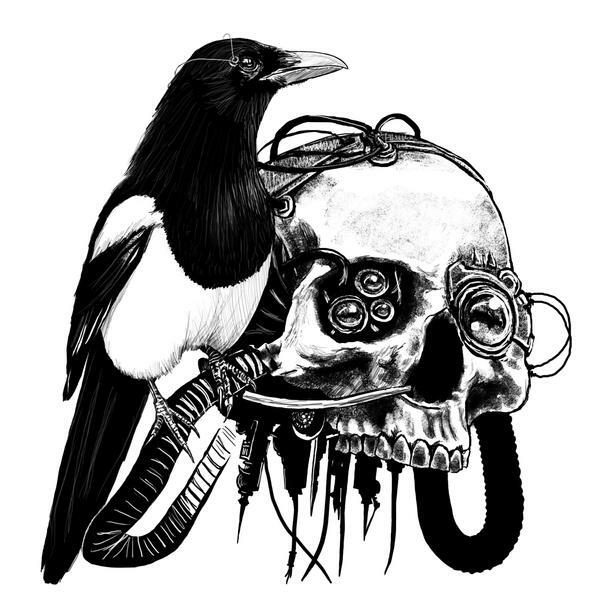 After finishing off my undead I started fishing around for something to follow them with, a pallet cleanser if you will, before getting back to Chaos and my slowly progressing warband for the Chapel. My hand fell on this distinctly Oldhammer Ork, a gift – alongside quite a number of other models – from a friend who was having a clear out. In spite of being a distinctly elderly model I wanted to paint him in a modern, grubby style, rather than the flatter, more garish tones preferred back when he was first released. I reckon it works well, and of course it ties him in nicely with his newer battle-bruvas. Of course he’s a little shorter than his new mates but there’s no need to take the mick out of him for it eh! 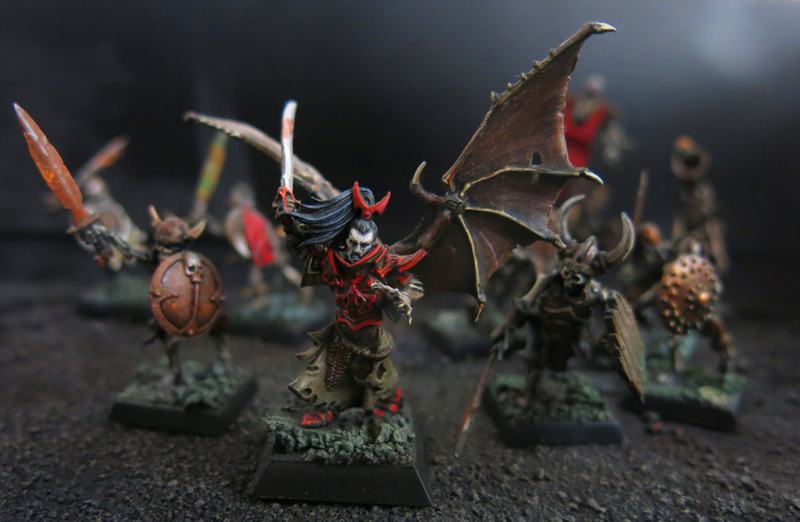 On Friday night I finally finished off the long awaited final models for my Vampire Counts army (not the most rock and roll start to the weekend but even I stop once in a while). On Saturday I uploaded them to this blog with, I’ll admit, very little fanfare. However, all things considered, that’s rather unfair. With one notable exception these are models I bought back in 2010(-ish, my memory isn’t so good) when I harboured plans for a massive undead army of the sort that might pour forth from Sylvania, spread eternal night across the land and so on. Instead they lurked in boxes (not even crypts – the shame of it!) as the years passed. Some of them were painted, to varying standards, many suffered through in nothing but bare plastic. Then, around New Year 2016 I resolved to resurrect them. Cue maniacal laughter and the distant howls of corpse-wolves! Fast forward a few months and here we have them, a shambling band of wights, ghasts and revenants, ready to trouble the living once more. And all without needing to move into a castle, hire an assistant named Igor or even buy a shovel. How, then, could I let the moment pass without a few glamour shots and a group shot or two? Let’s start with the finished squad of dire wolves, a kit which is (perhaps rightly) much maligned and yet for which I have a deep affection, in spite of its flaws. 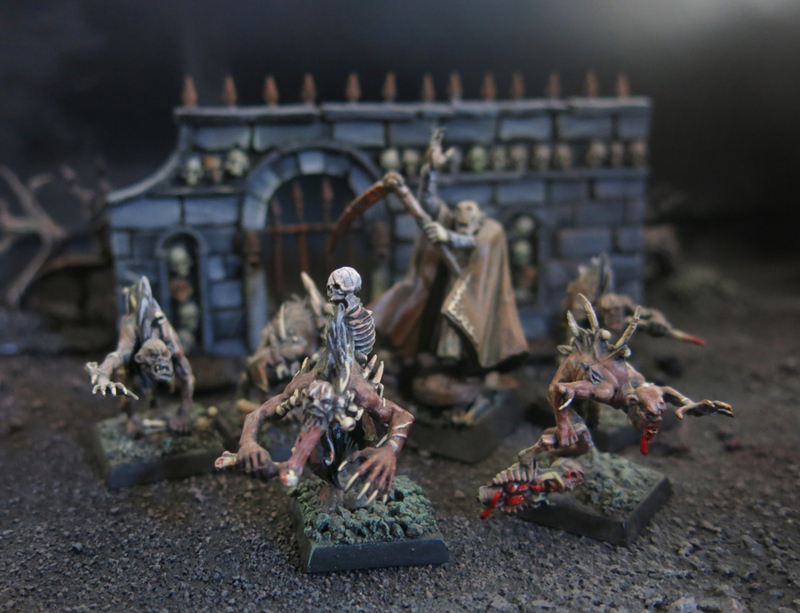 And how about some suitably creepy mood shots as my corpse army advances through the dark-magic saturated gravelands of their Sylvanian homeland. And of course no project of this sort can come to a close without a group shot. 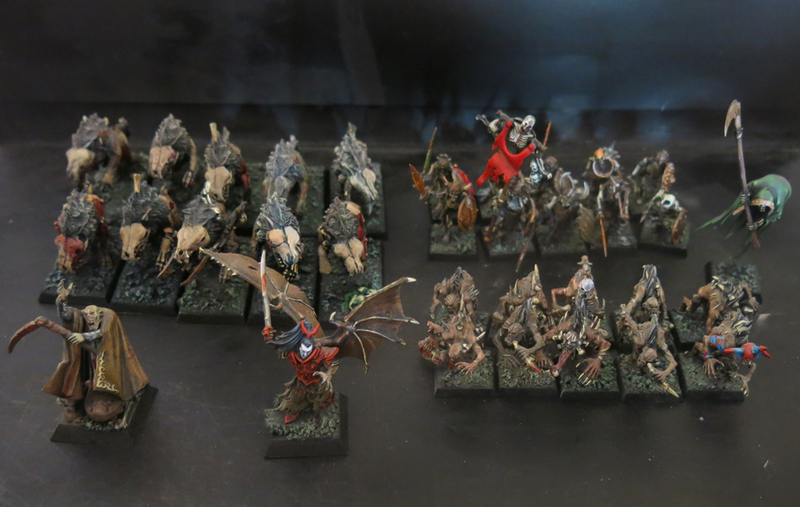 Of course, no army is ever finished and so it should come as no surprise that I’m already planning to return to these. Hopefully it won’t be another seven years before they’re reinforced. Hang some garlic by your window, bury me at a crossroads and watch this space!